National Drink Wine Day is on February 18, but no one says you need to actually drink your wine. Try making this port wine cheesecake so that you can eat your wine, instead! This is also a perfect cheesecake to serve all year – the light flavors of the cheese blend perfectly with the rich flavors of the port wine. Here’s the recipe. Preheat the oven to 350 degrees Fahrenheit. Add the graham cracker crumbs, almonds, cinnamon, and sugar to a food processor and pulse until combined. Cut the butter into small pieces and melt in the microwave or in a saucepan. Add the melted butter to the food processor and pulse until combined. Press the mixture into a 9 x 14 baking dish and bake for 20 minutes, or until the crust is golden brown. While the crust is cooking, you can prepare the filling. Make sure the crust is cooled to room temperature. Add the cream cheese and sugar to a large bowl and beat on medium speed with an electric mixer until smooth. Add the eggs to the bowl and beat them into the cream cheese and sugar mixture until smooth. With the mixer set on low speed, slowly add the port wine and the vanilla extract and beat until everything is well combined. Pour over the prepared cheesecake crust and bake in the oven until the cheesecake is cooked all the way through, which should take about 20-25 minutes. Take the cheesecake out of the oven and let cool on the counter at least 15 minutes before serving. Garnish each slice with fresh fruit. Wine Cheesecake. Prepare the cheesecake recipe as listed above. Use 1/3 cup of sweet red, white, or rose wine instead of the port. 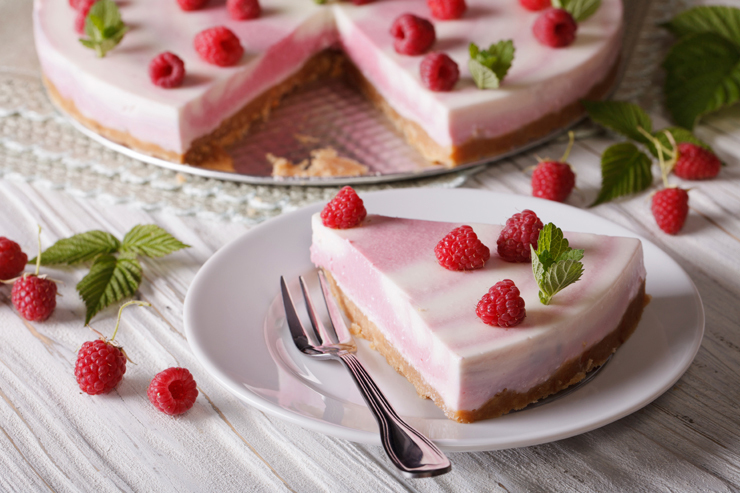 Raspberry Cheesecake. Prepare the cheesecake recipe as listed above. Use ¼ cup port instead of the 1/3 cup that was originally listed. Add 1 tablespoon of raspberry liqueur to the filling when you add the port and prepare the recipe as usual. Garnish this cheesecake with fresh raspberries. Sangria Cheesecake. The next time you make a batch of sangria, reserve 1/3 cup to make the cheesecake recipe listed above. You can also use store bought sangria. Just substitute the sangria for the port wine. Champagne Cheesecake. Prepare the cheesecake recipe listed above. Substitute the port wine for 1/3 cup champagne, prosecco, or sparkling wine instead. Strawberry Wine Cheesecake. Prepare the cheesecake recipe listed above. Use 1/3 cup strawberry wine instead of the port wine. Garnish each slice with fresh strawberries and a dollop of whipped cream.